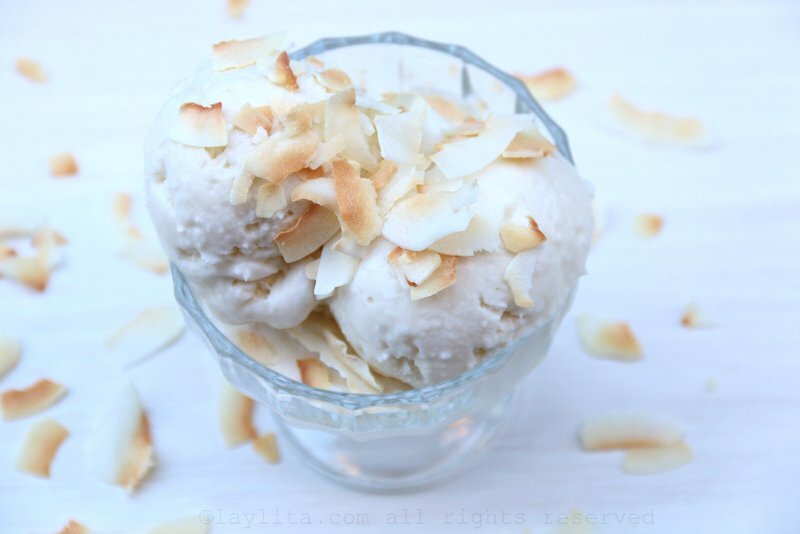 Coconut ice cream has always been one of my favorite desserts, actually anything with coconut in it: from sweets like cocada coconut candies to coconut flan and coconut cake, to savory dishes like coconut fish stew (encocado de pescado), and of course, any drink or cocktail with coconut: batido de coco, chicha de coco, piña coladas, etc. One of my favorite memories of coconut ice cream is of these coconut popsicles that they used to sell near the San Sebastian park in my hometown of Loja, Ecuador. They had a small layer of strawberry gelatin on each one and the coconut part itself was full of grated chunky coconut pieces – so good! 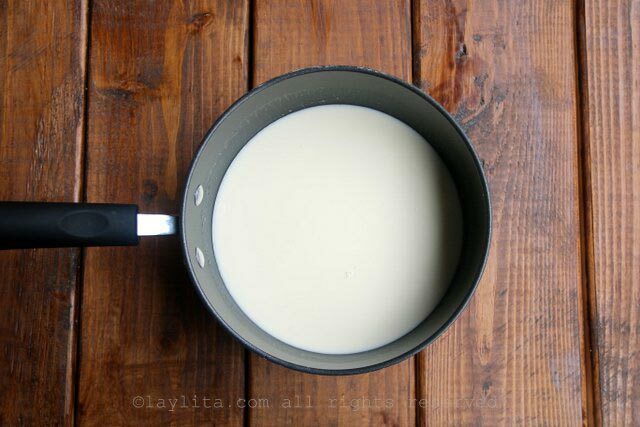 In a medium sized sauce pan, combine the coconut milk, cream, and sugar, heat and mix until the sugar has dissolved completely. Mix in the rum and coconut extract. 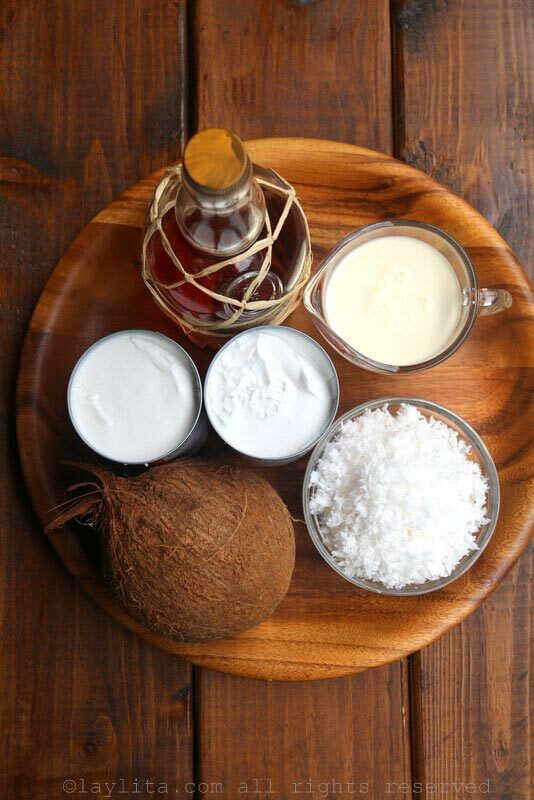 Taste and adjust the amount of rum or coconut extract based on your taste preference. Let the mix cool down completely. Prepare the ice cream according to your machine’s instructions. 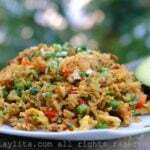 Add the freshly grated coconut at the end. For the non-ice cream machine option, place the coconut milk mix in a plastic or metal freezer friendly container and freeze for 1 hour. It should be semi-frozen, but still somewhat soft. 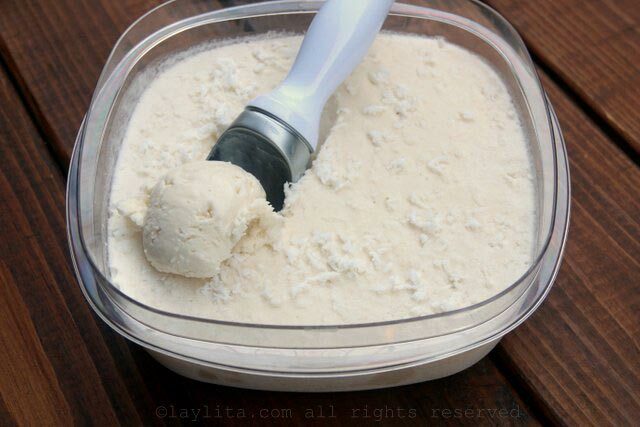 Remove from the freezer and use an electric mixer to soften the mix. You can also place it in a food processor or a blender and mix (just make sure your blender is powerful enough to blend frozen foods). 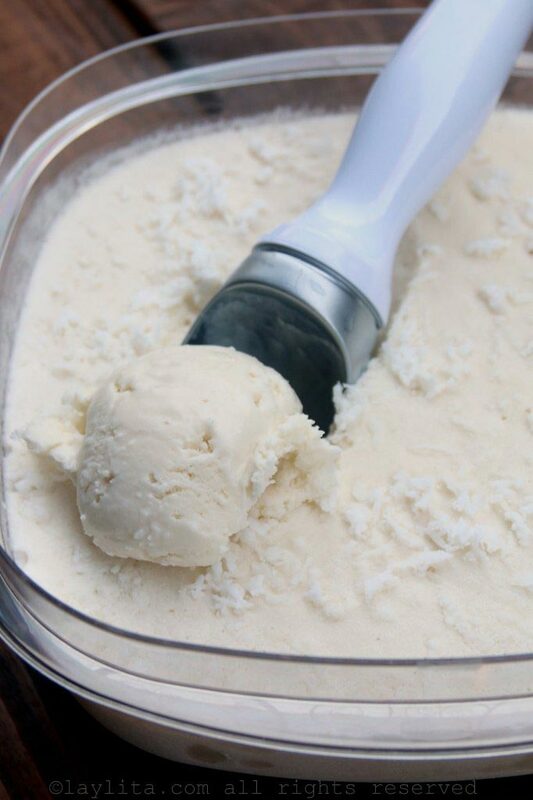 Return to the freezer and let it rest for another hour, then repeat the process for 3-4 times or until you’ve achieved the desired smoothness, add the freshly grated coconut during the last time that you mix it. Let the ice cream rest in the freezer for a couple of hours before serving. 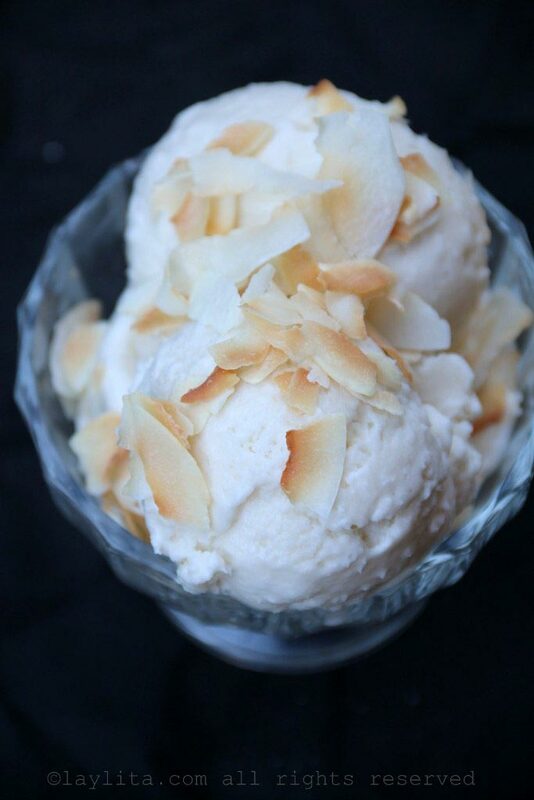 Serve the coconut rum ice cream with toasted coconut shavings or with your choice of fresh fruit. 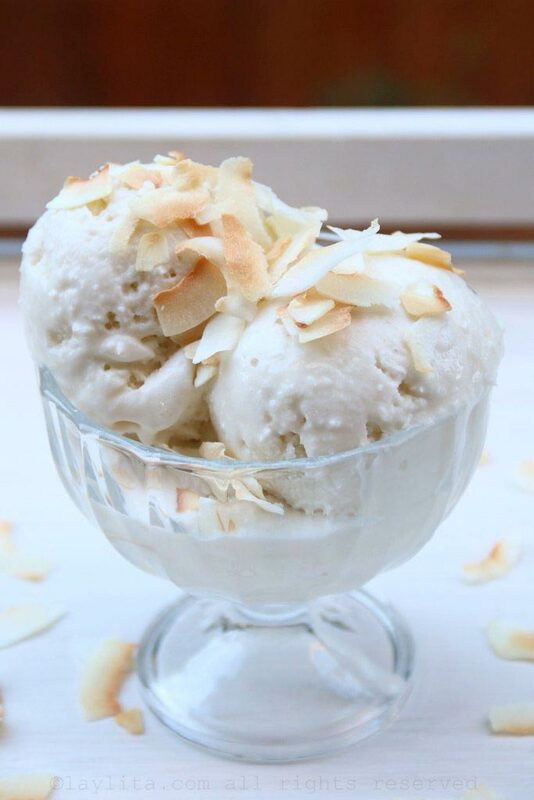 For this particular variation of coconut ice cream I wanted to make some ice cream that I could serve with sweet caramelized plantains or bananas. 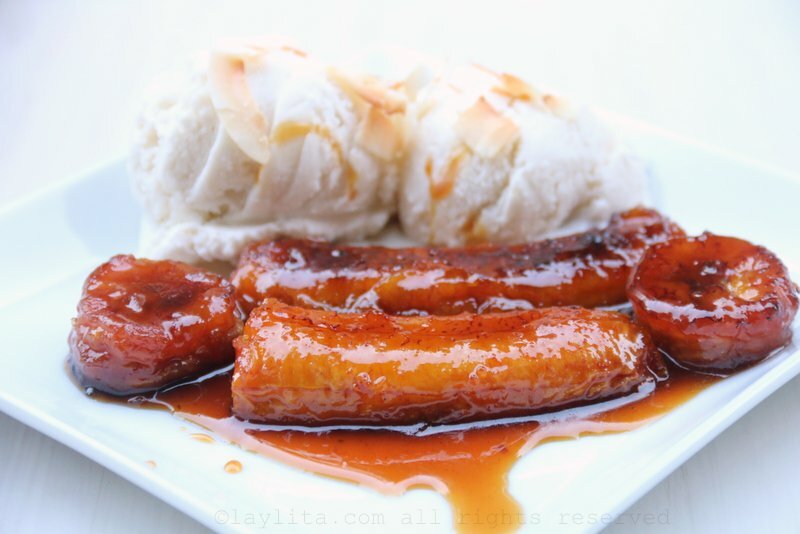 I love the combination of coconut and rum, and knew that it would also go very well with the plantains. I used dark rum for this recipe, but if you prefer to not include alcohol you can use an imitation rum extract instead – though keep in mind that the liquor actually helps the consistency of the ice cream to stay smooth. 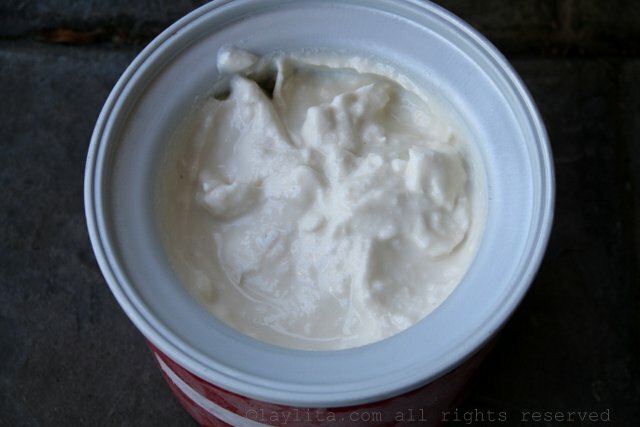 I also used a combination of coconut milk and heavy cream for that creamy consistency, you could make this recipe with just coconut milk for a non-dairy option, but it will have more of a sorbet texture (which is still delicious). 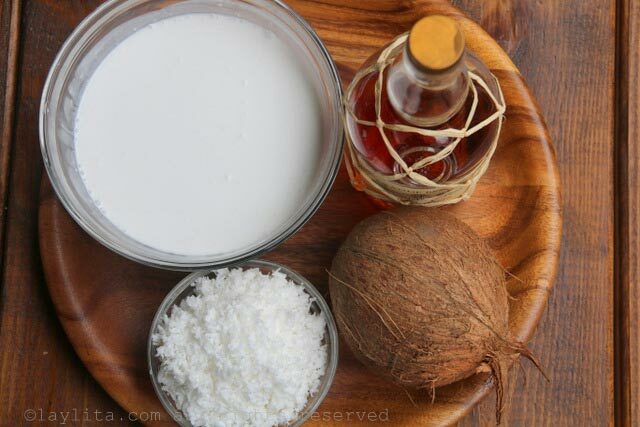 Another option is to make it using coconut milk and sweet condensed milk (in place of the cream and sugar). 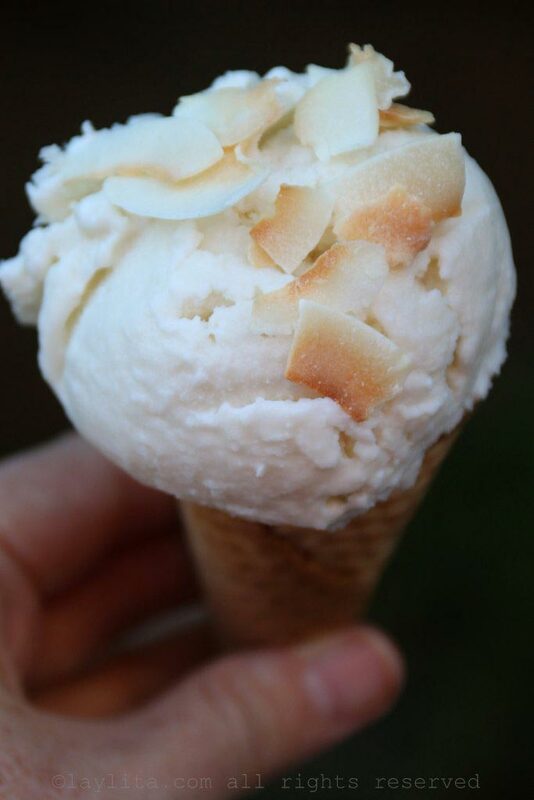 I also added freshly grated coconut, to give that chunky texture from the popsicles I loved as a kid. It’s very easy to find coconuts at most grocery stores, however I find that the quality isn’t always that good (or fresh tasting), so I usually keep some frozen grated fresh coconut in the freezer as a backup. My local Asian grocery store usually has a good selection of both fresh coconuts and good frozen grated coconut pulp. 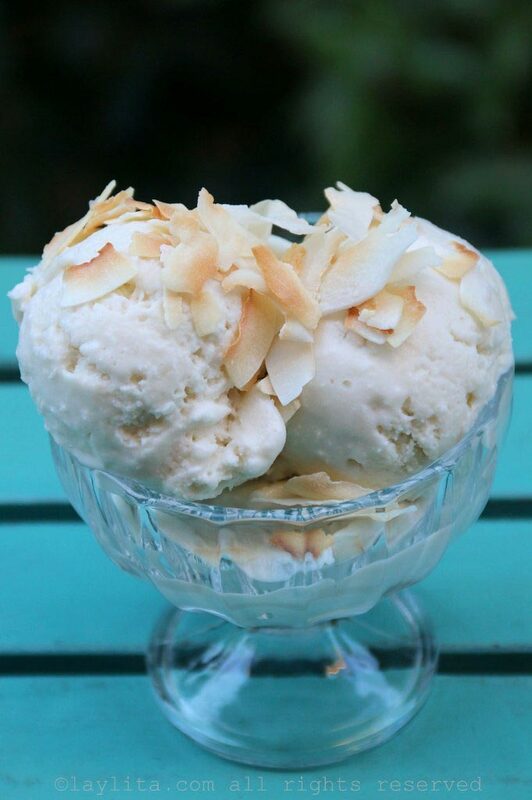 I served the ice cream topped with roasted o toasted coconut, to contrast between the flavors of the creamy fresh coconut and the more intense nutty flavor of the toasted coconut shavings. 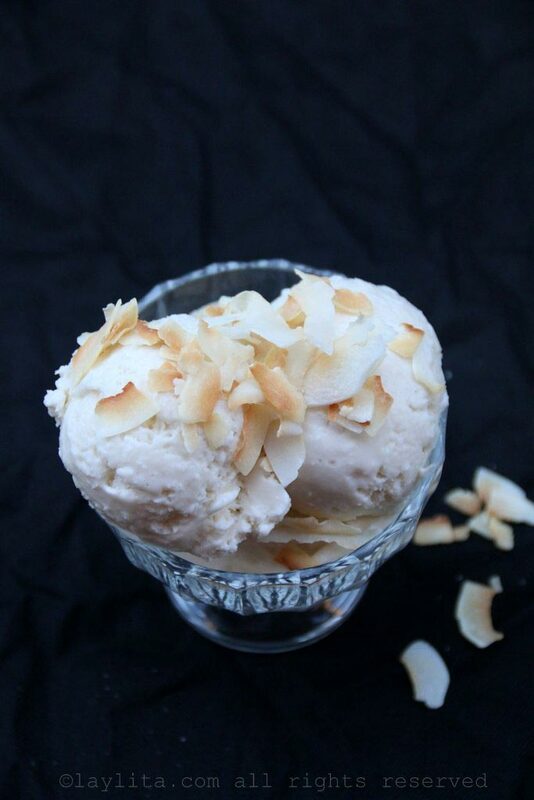 You can also serve this coconut rum ice cream with slices of fresh fruit (think tropical fruit like mango, pineapple, etc), or caramelized fruit (plantains, bananas, pineapple, etc) or just as is. I do not fresh frozen coconut in my area. Do you think I can use dried in the ice cream or better to omit and use as garnish? Thanks for your help! 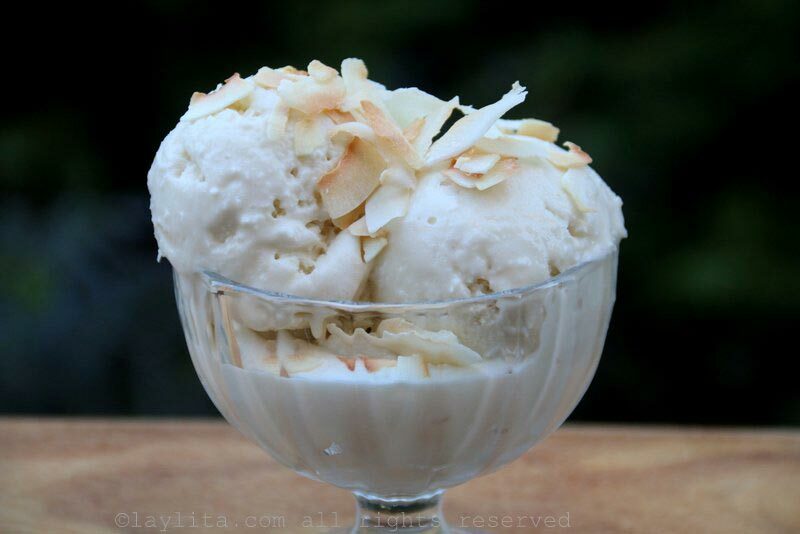 You can add a small amount of the dried coconut to the ice cream mix if you don’t have the fresh one. 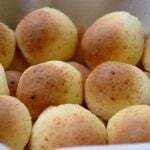 Please translate the recipe to Spanish. I live in ARGENTINA and say in Spanish!